It’s that time of year, folks. Yes, it’s zucchini season. Isn’t is amazing how one little seed so innocently and hopefully planted in the spring grows into a monster plant covering at least twice as much area as you estimated? And producing more dang zucchini than you and your family can possibly eat? And you don’t dare leave one unpicked once you notice it. Oh, no. That unpicked zucchini out there? By the time you come back to check on it it’s the size of a baseball bat. I swear that stuff grows faster than kudzu. And that’s saying something, y’all! Well, I’ve got a recipe for you today that just might make you happy to have that extra zucchini on hand. It’s a beautiful Tomato Zucchini Tian that uses some of the best of your summer veggie crop. 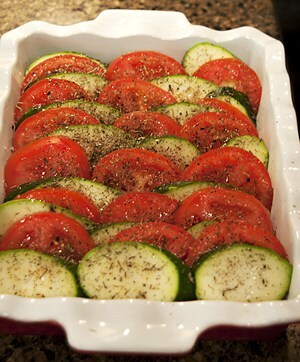 A tian, by the way, is a layered, baked vegetable dish that originated in the Provence region of France. That’s just exactly what this is. Layers and layers of deliciousness. You start by prepping an eggplant. Peel it and cut it into 1-inch cubes. Sprinkle some salt over the cubes and put them in a colander. Leave them to drain for about 30 minutes. The salting and draining process pulls out the bitter taste of the eggplant along with some of the moisture. Next you’ll saute the onions and garlic in some of the olive oil until they’re soft and slightly browned. It takes about 30 minutes. Transfer them over to a baking dish. Then add a little more oil to the same skillet and brown the eggplant. I stir it constantly to prevent it from sticking and it takes maybe 5 minutes to get it slightly softened and just barely browned. Season it with salt and pepper and add it to the onions and garlic in the baking dish. Now, start preheating your oven while you arrange your sliced zucchini and tomatoes over the eggplant-onion mixture. Top everything with a generous sprinkle of salt and pepper, Herbes de Provence and the rest of the olive oil. 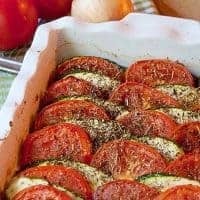 Pop it into the oven and bake for 40 to 45 minutes or until the zucchini is tender and the tomatoes are just barely beginning to brown on the edges. Remove the dish from oven and let it cool for 5 or 10 minutes before serving. Top with Parmesan cheese if you like, but I think it’s really tasty as is! Layers of tomatoes and zucchini over a bed of eggplant and onions. 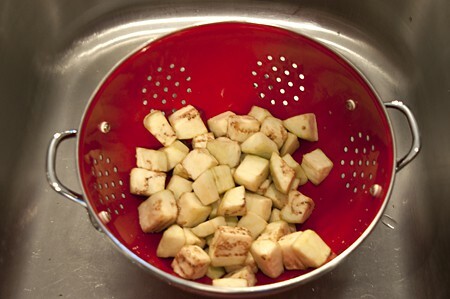 Cut the eggplant into about 1-inch cubes. Sprinkle generously with salt and place in a colander. Let the eggplant drain for 30 minutes then remove it and pat dry. Heat a medium-sized skillet over medium-high heat. Add 3 tablespoons of the olive oil and cook the onions and garlic until slightly browned, about 10 minutes. Transfer to a medium baking dish. To the same skillet, add another 2-3 tablespoons of olive oil and cook the eggplant, stirring constantly, until tender and slightly browned. About 5 minutes. 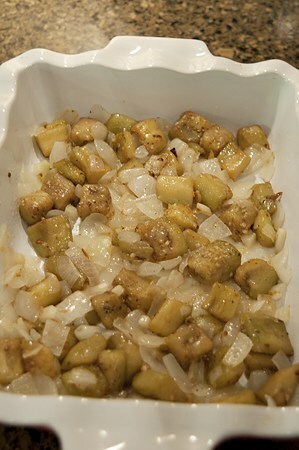 Season the eggplant with salt and pepper and stir into the onion mixture in the baking dish. Preheat the oven to 400 degrees. Arrange the sliced zucchini and tomatoes over the eggplant and onion mixture. Sprinkle with the Herbes de Provence, drizzle with remaining oil and season with salt and pepper. Bake for 40 to 45 minutes or until the zucchini is tender and the tomatoes are beginning to brown around the edges. Remove from the oven and allow to cool for 5 to 10 minutes. Sprinkle with the Parmesan cheese if using. I think you’ll really enjoy it, Maria. Such a beautiful summer dish. main dish here at Smith Bites – LOVE! Don’t laugh at me….but I have never ever used herbs de provence…I just really didn’t know how to use it!! Now I know…I will have to try this, it looks like a delicious summer meal! I wouldn’t ever laugh at you, Shelby! Actually, I think there are slightly different blends of Herbes de Provence depending on the brand. I order it from My Spice Sage and their blend contains savory, thyme, rosemary, lavender and fennel. It’s really great on fish or grilled chicken and wonderful with eggplant. I also use it in my Savory French Toast recipe. With the zucchini starting to come in, this looks like a dish to try. Gorgeous photos! This is such a pretty way to present all of that summer produce that is starting to explode in my garden. Lovely dish, Lana! Wow, just the photo alone is awesome. I’d love to try that. This looks so healthy! So in season right now too. Sounds like “Tian” is French for vegetable casserole, it also looks similar to another, now very popular, French dish, Ratatouille!!! Your pictures and recipe both look wonderful.